At times during your pregnancy, you might have mild pelvic symptoms that feel similar to menstrual cramps. Most of the time, this will be just part of the normal "growing pains" of pregnancy. However, be aware of other potentially serious causes of pelvic cramps. Consult your doctor or midwife if you have additional symptoms or your cramping becomes moderate or severe. It is normal for some women to experience menstrual-like cramps at the time the early embryo (the blastocyst) implants in the uterus. Implantation occurs between days six to twelve (average nine days) after ovulation, according to a study published in the New England Journal of Medicine. Implantation cramping is a normal early sign of pregnancy, although most women are not aware of what it is at the time it happens. The cramping usually lasts one or two days, but some women might continue to have several days of mild discomfort. You can also have implantation bleeding (very light bleeding or spotting) with the pain as your pre-embryo invades small blood vessels underneath the lining of your uterus. Treatment for implantation pain is rarely, if ever, necessary. Many pregnant women have menstrual-type pelvic cramps around the time they expect to get their next period. Having period-like cramps during early pregnancy is normal and might feel like your period is about to start. When your period doesn't come and you start to have other symptoms, such as fatigue or breast tenderness, you might begin to realize you are pregnant. You are unlikely to need treatment for these mild menstrual-type cramps. Pain on the sides of your pelvic cavity (rather than in the middle) might be caused by the round ligaments, which help to hold your uterus in place. According to the Mayo Clinic, your cramps can feel like muscle spasms when the ligaments pull on nerves and other tissues. You might also feel the discomfort near one or both groin areas in the tissues covering the front of your pubic bone. Your round ligaments insert in the tissues through a canal in your pelvis. You can start to feel cramp-like pain during the first trimester when the ligaments start to stretch as your uterus grows. It is more common, however, to feel round ligament cramps in your second trimester because the ligaments continue to lengthen as your uterus grows out of your pelvis. Round ligament pain is normal but can be bothersome. Some women might need short-term pain medicine to cope with it. As your fetus develops and your uterus expands over the next few weeks and months, your sometimes-painful menstrual cramping might continue. From the size of small fist before pregnancy, your uterus has to grow to accommodate your full-term baby. Seek medical care if your pain gets severe, which might mean a more significant problem. Braxton Hicks contractions are more common in the third trimester. However, they can start as early as 20 weeks of pregnancy, according to Dartmouth-Hitchcock. Some women might mistake the uterine cramps for labor contractions, but they tend to be come and go without a regular pattern, unlike labor, and not last long. Braxton Hicks prime your uterus for your upcoming labor at term and near your due date, help ripen your cervix for labor. The fleeting cramps are milder than labor contractions, do not worsen with time, and you usually will not need medicines for pain. Call your doctor or midwife if you can't tell whether you are having labor or Braxton Hicks contractions, especially if your pregnancy is less than 36 weeks. It is important to note menstruation cramps during early pregnancy can also be a sign that you have a problem, such as an ectopic pregnancy. According to MedlinePlus, an ectopic pregnancy happens when your embryo implants outside your uterus, most often in a fallopian tube or an ovary. You will usually have one-sided pelvic pain, rather than in the midline. There is often vaginal bleeding or spotting, which could be on and off. The cramps will increase as the ectopic grows. More severe pain can also be caused by leaking of blood from the tube or ovary, or rupture of the pregnancy. 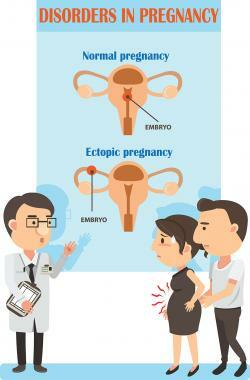 Rupture of an ectopic can lead to death if not treated quickly. If you have severe one-sided, crampy pain and abnormal vaginal bleeding, you should seek medical care immediately. This is especially important if you are also lightheaded and dizzy as these could be signs of significant internal bleeding. Most miscarriages occur in the first trimester, according to the American College of Obstetricians and Gynecologists. Pelvic/abdominal menstrual-like cramping is one of the early symptoms of a threatened or inevitable miscarriage. The symptoms and signs present as follows. The midline cramps can be mild but tend to be more severe if the miscarriage is inevitable or incomplete. The more advanced your pregnancy, the more severe your pain will be. Vaginal spotting or bleeding will be present if you are having cramps related to a miscarriage. Only time will tell if your pregnancy will miscarry or continue. Always see your doctor to be evaluated for an abnormal pregnancy if you have pelvic pain accompanied by vaginal bleeding. Urinary tract infections (UTIs), and bacteriuria (bacteria living in the tract without causing an infection) are common problems in pregnancy according to a review by American Family Physician. These two conditions can cause crampy pain in the bladder or urethra that might mimic uterine menstrual cramps. With a UTI, you will usually also have burning on urination and the need to run to the bathroom often. It is important to see your doctor as soon as possible if you have these symptoms with your pelvic cramps. Bacteriuria and bladder infections can increase the risk of kidney infection, miscarriages, and preterm labor. According to the Centers for Disease Control and Prevention, pregnant women are not immune to getting sexual transmitted infections (STIs). Initially, you might have menstrual-like pelvic cramps if your cervix or uterus is infected. Your pain can get worse as the infection develops. See your doctor if your cramps are getting more severe and you have a smelly vaginal discharge and a fever. STIs put you at risk for a miscarriage in early pregnancy and preterm delivery in the late second trimester and in the third trimester. You and your baby are also at risk for other poor outcomes. Pressure of your growing uterus on your bowels can cause menstrual-like pain that might be difficult to distinguish from uterine cramps. The pain might increase when you are constipated. Constipation is a common condition throughout normal pregnancy and can, itself, be a cause of crampy bowel pain. The cramps from constipation can improve after you move your bowels. See your doctor for an evaluation and discuss a need for laxatives if your constipation and cramps are a problem. In addition, increased exercise, water, and fiber in your diet can help your constipation-related bowel pain. 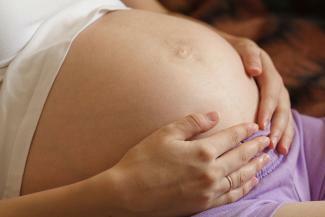 It is not unusual to have menstrual-type cramps during pregnancy. Most of the time, the pain does not indicate a significant problem. However, moderate to severe period-line cramps when pregnant can signify a bigger problem. Call your doctor if your cramps concern you, especially if you also have other symptoms, such as vaginal bleeding, burning when you urinate, dizziness, lightheadedness, or fainting spells.